Luke is originally from Albuquerque, New Mexico where he attended the University of New Mexico. He graduated with a BA in history with a minor in anthropology. Upon graduation, Luke moved to Spokane, Washington and attended Gonzaga University School of Law where he graduated in 2016. 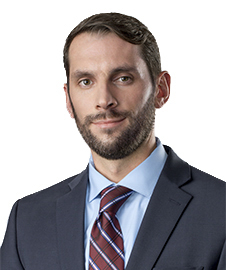 While in law school, Luke worked as a student attorney at the Unemployment Law Project where he represented clients and litigated on their behalf at unemployment security administrative hearings. Luke also worked as a judicial extern for the Honorable John Cooney of the Spokane County Superior Court. Luke was also an associate editor for the Gonzaga Journal of International Law. After law school, Luke worked as a law clerk for the Honorable Patrick Flanagan at the Second Judicial District Court. Luke enjoys hiking and skiing in the Sierras, biking, basketball, football, and spending time with his wife Sarah and their two dogs.